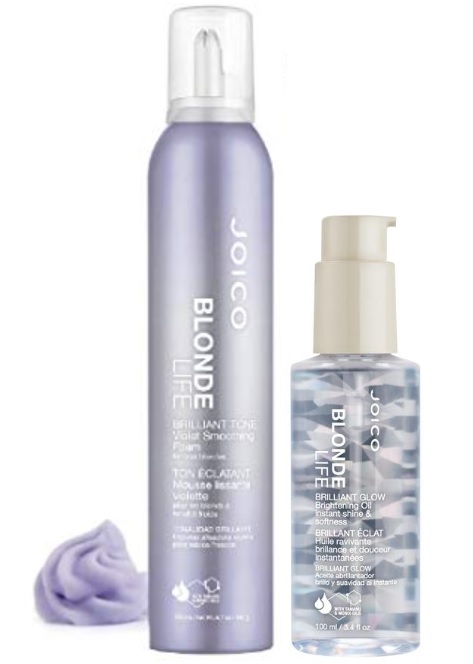 Two new products help you live the Joico Blonde Life! Joico Blonde Life Brilliant Glow Brightening Oil - 100ml - $27.65 - seals in moisture and instantly revs up the radiance of even the lightest hair, nourishing, stengthening and protecting each delicate strand with a mega-watt gleam while banishing frizz and leaving it silky and soft to the touch. Joico Blonde Life Brilliant Tone Violet Smoothing Foam - 200ml - $25.95 - a super-light, dual-action styling breakthrough that instantly tones blond hair, banishing brassiness while smoothing and polishing each strand and leaves hair exceptionally smooth, frizz-free, super soft and bright. Available now at participating Joico salons - to find one near you call 1-800-267-4676 or at joicocanada.com.